Lessons learned from Small Victories. As with any hobby or passion, the more time you devote to it, the more you’ll learn tricks, shortcuts, and valuable lessons that aid you in your craft. There’s one way to cut corners in this process, though: standing in the shadows of those who are already proficient in the skill you’re trying to master. Talk to any experienced painter and they’ll surely be able to offer advice on which shade of paint to use to achieve a particular lighting effect; strike up a conversation with any adept pianist and you’re guaranteed to learn a little something about matching melody to harmony; tap the wisdom of any seasoned chef and you’ll no doubt walk away with a kernel or two of information on how to become a better home cook. 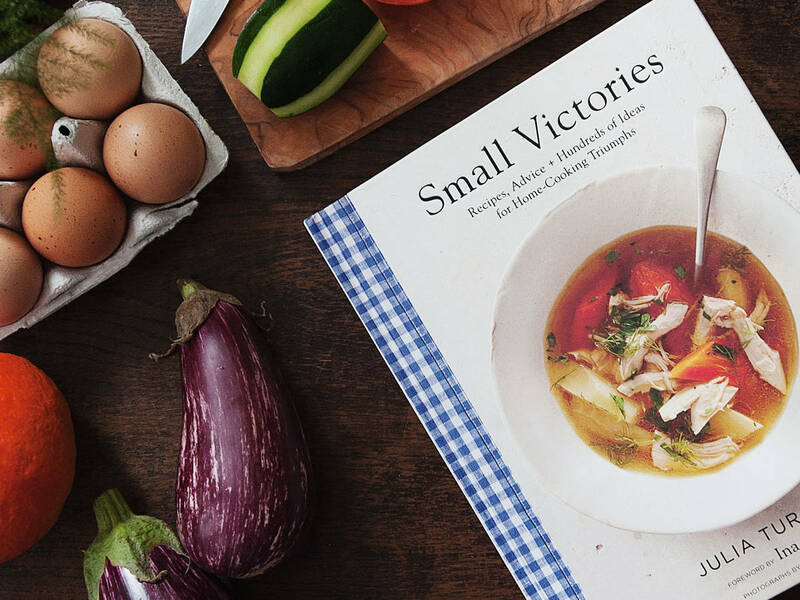 In her latest cookbook, Small Victories, renowned chef and author Julia Turshen has assembled a wealth of valuable cooking tidbits that she’s learned over the years. We’ve distillated five of our favorite lessons from this incredibly useful and enjoyable text. Don’t let yourself be unnecessarily sold to when it comes to kitchen gear. You only really need three knives: a sharp chef’s knife, a serrated bread knife, and a small paring knife. Anything else is superfluous and just takes up space. You’ve probably heard at some point that “Love is the most important ingredient.” That may be true, but one thing is for certain: stress affects your ability to cook well. If you aren’t calm, composed, and organized in the kitchen, you’re more likely to make a mistake or rush something that requires patience. Your gut instinct in the kitchen will often be right. Allow your sense of smell, touch, and sight to guide you. Cooking times are approximations at best. Get to know your food; develop an intimate relationship with it and trust your own best judgement. Don’t just throw away your veggie scraps! Keep a re-sealable bag in your freezer and gradually fill it up overtime. When it’s full, you can make homemade vegetable stock or use the scraps for chicken or beef stock, as well. This is perhaps the most prescient lesson in Small Victories. Learning a few basic techniques and styles of cooking will unlock a world of potential for you. With each recipe, Turshen offers further suggestions and variations of what you can cook using the same ingredients and procedures. For example, in her recipe for sour cream pancakes with roasted blueberries, she offers parenthetical advice at the end about substituting the sour cream for crème fraiche, as well as tips on how to roast fruit toppings for added flavor.